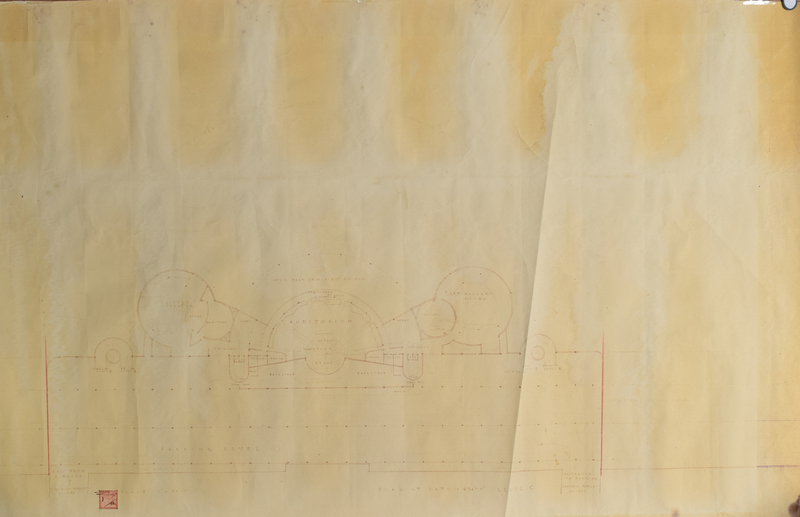 Original 1956 blueprint for the Monona Terrace Community and Convention Center in Madison, Wisconsin, accomplished by Wright in graphite on an off-white 45.25 x 27 sheet of drafting paper, signed in the lower left in a small shaded box in ink, "F Ll W/56." The blueprint shows a 1? to 32´ scale overhead view of the entirety of the convention center, noting in the lower right, "Plan at Datum +34´—10? Level C." The bottom of the outline depicts "Parking Level C," a forty car capacity lot with stairwells at top of each side; the main auditorium consists of sections listed as "Upper Part of Exhibition Hall," "Promenade," "Orchestra," "Stage," and "Backstage," and features various abutting office, lobby, and toilet areas; the "Little Theater" and "Art Gallery" are positioned to the far left and right, with upper portion of blueprint bearing faint captions, "Open Down to Water" and "Future Level B Park." Rolled and in good condition, with scattered creasing, some tape to edges, a few stains, and overall irregular toning; the printing is somewhat light but completely legible. 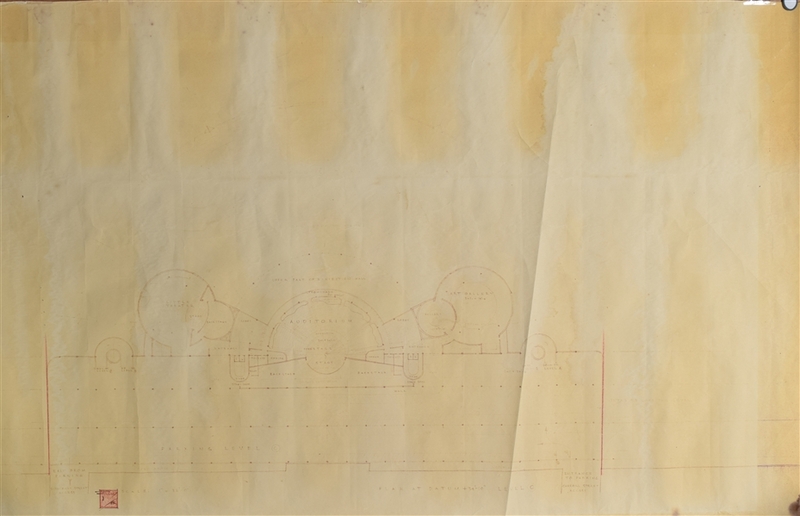 In 1938, Frank Lloyd Wright proposed a design for a civic auditorium that would link Lake Monona with the State Capitol building two blocks away. Initially defeated at a County Board meeting by one vote, Madison voters approved a bond referendum for a civic center in 1954-1955, and Wright was chosen as project architect.